On Monday afternoon, Wei asks me if I can get off work early so that we can go to the city to see a viewing of the new show, Reed Between the Lines. 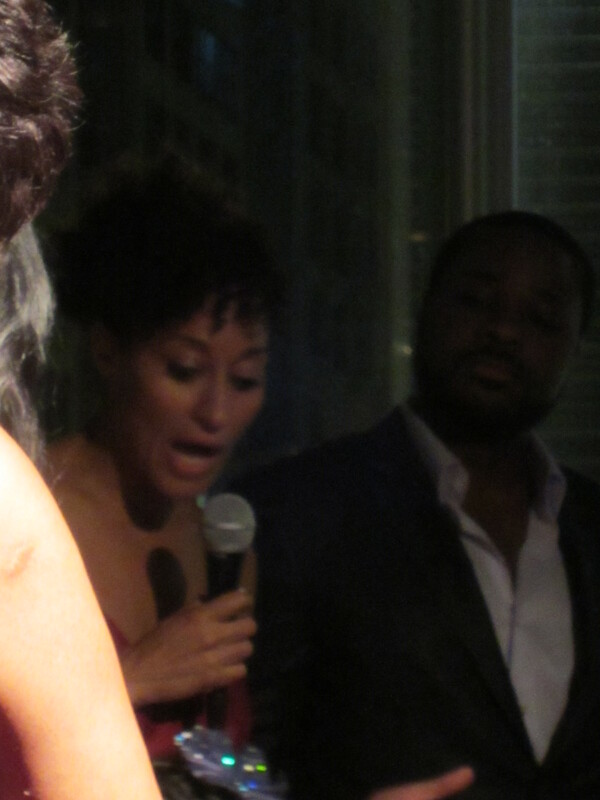 A chance to see Tracee Ellis Ross, hair crush of almost every natural? How could I turn that down? But yeah, this is about all you are going to get today as it’s 6:47 a.m. and I’m supposed to be doing my sit-ups! So, here are some pics and I’ll try to give you more details and some GOC updates later tonight! But, check out the show tonight on BET at 10, after the BET Hip-Hop Honors (which I watch while on FB just to read and laugh hysterically at the running commentary)! It looks cute and they need our support to keep uplifting family shows on TV!! Yeah, my hair was all oily with a pre-poo!! Banana clip bun to the rescue again! Tracee seems so nice and funny. She had her hair in a simple ponytail with bangs. You should have seen her shoes! Kanye West was in the house too! I was arm’s length from him, but Wei wouldn’t let me take a picture ;)! Malcolm and Wei have been friends for a while. I really liked him. So genuine and smart. Oh, oh, oh! And get this! Anna Marie Horsford (remember her from the Wayans Brothers? Love her!) was wearing a Sofistafunk skirt! *Okay, I’m not going to get Abs of Steel in this morning, so I declare my intentions for Day 8 are to do it tonight and then C25K, week 1, on the treadmill. LOL!! Valencia, I don’t know when I got this life! Actually, I do! Hairscapades has been a boon! Also, the SO definitely helps get me out more too:). From what we can see, you do that life very well!! It’s good to see! How cool is that. Your SO is the greatest WOW! That is so awesome!!!!! Blessings come to those well deserved! Marsha, I know, right?!?! LOL!! Can u say STAR STRUCK!!! I probably would have peed my pants to be in the same room w/ T.E.R. Shout out to Wei for helping you maintain your composure in front of Kanye. I know it was hard girl, LOL!